The longest-running show in Broadway history, Andrew Lloyd Webber's The Phantom of the Opera, will welcome West End star and Platinum-selling Swedish recording artist Peter Jöback beginning April 29, producers of the musical announced on Jan. 26, the 25th anniversary of the Broadway production. Jöback will assume the title role in the Tony Award-winning musical, directed by Harold Prince and produced by Cameron Mackintosh and The Really Useful Theatre Company, Inc., through Aug. 24. 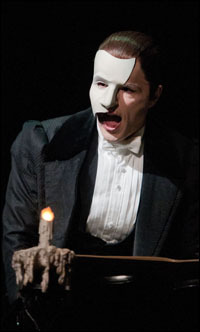 He will succeed current star Hugh Panaro, who will return Aug. 26. Jöback took part in the Jan. 26 festivities, when Phantom became the first Broadway show to celebrate 25 years. The milestone was marked by a gala performance at The Majestic Theatre, the musical's home for its entire run, and featured an elaborate curtain call with remarks from producer Mackintosh and director Prince; a specially-taped video greeting from composer Lloyd Webber (in London and unable to attend due to a back procedure) and original West End and Broadway star Sarah Brightman (their first joint interview in 30 years); as well as onstage post-show performances from current stars Panaro and Sierra Boggess, who were joined by international Phantoms John Owen Jones, Ramin Karimloo and Jöback. The evening also featured a Mayor's Proclamation that named Jan. 26 "The Phantom of the Opera Day," as presented by Katherine Oliver, commissioner of New York City Mayor's Office of Media and Entertainment. The festivities at the theatre were followed by an exclusive and lavish gala at The New York Public Library. Jöback starred in the title role in the London production of Phantom in 2012, but his association with the musical stretches back to London's 25th anniversary celebrations at Royal Albert Hall in October 2011, when he was chosen to perform as one of the International Phantoms alongside Brightman during the curtain call. On the London stage, Jöback starred as The Phantom and has also been seen in Miss Saigon and The Witches of Eastwick. Jöback is a platinum-selling Swedish recording artist and performer, and he has been awarded gold and platinum discs for all of his releases as well as several Grammy nominations. Boggess will conclude her limited engagement as Christine March 2. Current Christine alternate Samantha Hill will assume the role as Christine beginning the week of March 4. Marni Raab will return as the Christine alternate. The current cast also includes Kyle Barisich as Raoul, Jim Weitzer (Monsieur André), Tim Jerome (Monsieur Firmin), Michele McConnell (Carlotta), Ellen Harvey (Madame Giry), Christian Šebek (Piangi) and Kara Klein (Meg Giry).